Some of the sketch cards I drew this year for March of Dimes: Hulk, Sue Storm and Reed Richards. I was recently invited to draw five sketch cards for a charitable organization called Be a Superhero for Babies, which raises funds for March of Dimes. The effort was kicked off in 2008 by a gentleman named Steven L. Frank; this is the sixth card series Steven has organized, and the fourth in which I participated. Two more sketch cards I drew this year: Ant-Man (with the ever-present Wasp) and the Silver Surfer. I jumped at the opportunity for two reasons. My second reason for joining in is more selfish. Contributing artists are permitted to draw any character “your heart desires.” It’s unlikely DC or Marvel will ever greenlight a book written and drawn by myself (although, DC co-publishers Dan DiDio and Jim Lee should give serious consideration to my pitch for a Metal Men miniseries set during the Cuban Missile Crisis). So here’s an opportunity to draw some favorite characters in, at least, a semi-official setting. Yeah, I admit to a bit of straw-grasping here. This time around, I was in a Marvel mood. Marvel aficionados will notice that I heavily referenced specific panels from Silver Age comic books (usually those by Jack Kirby). 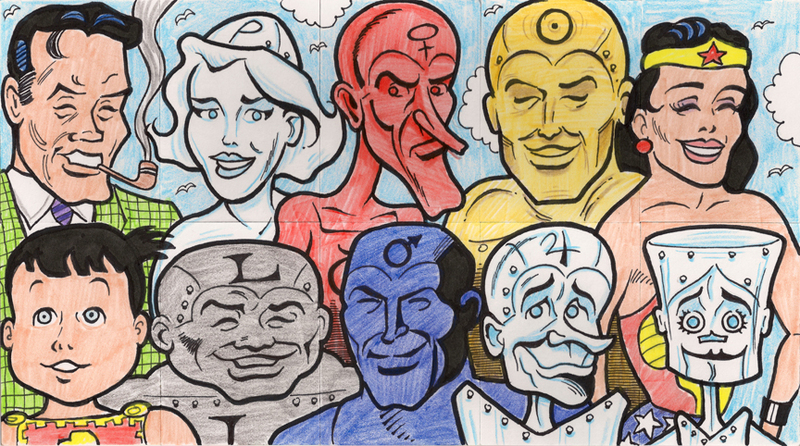 For earlier card series, I drew the Metal Men (are you sensing a pattern? 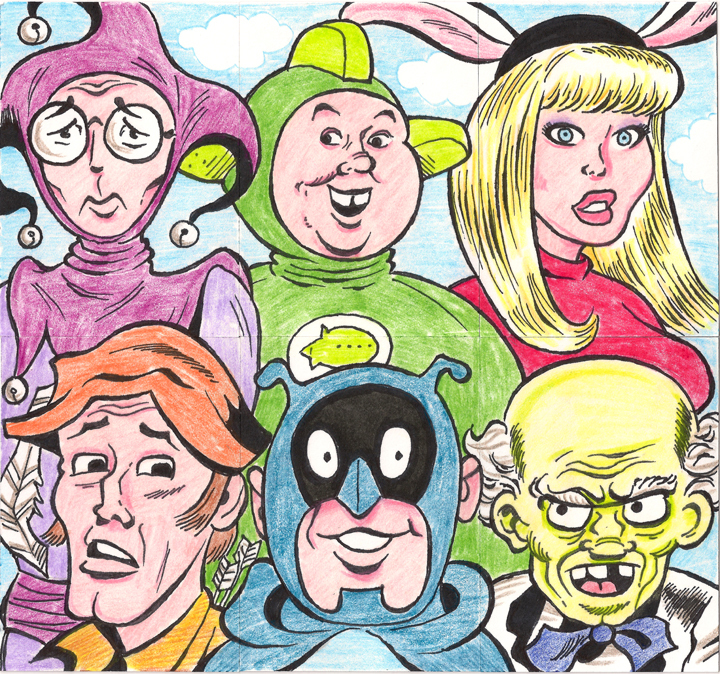 ), the Inferior Five and a bunch of Archie characters. I had fun doing the Archies, but the card stock was glossy, so you could only really color with marker. Anyway, following are samples of my past sketch cards. I hope you get a kick out of ’em (and I hope they make a little scratch for Be a Superhero for Babies). Above are my Metal Men cards. I threw in Wonder Woman and Wonder Tot, two characters also drawn by the fabulous, undersung team of penciller Ross Andru and inker Mike Esposito (the guys who co-created the Metal Men with editor/writer Robert Kanigher). I drew the cards sort of like a puzzle — each card is a standalone, but together they form a little scene. 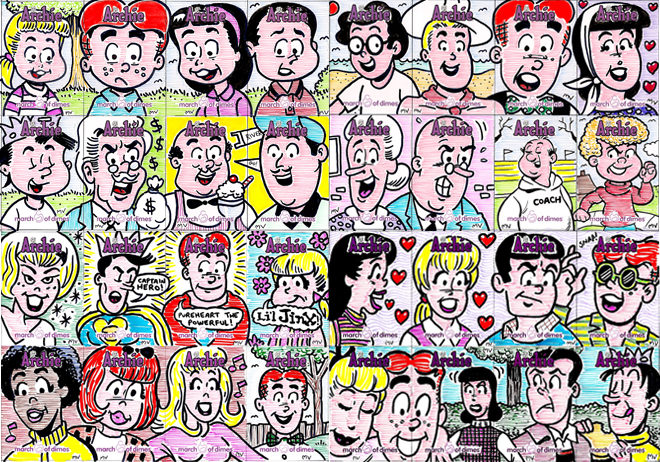 I drew a whole bunch of Archie characters for March of Dimes. As you can see, the coloring is not so hot, due to the glossy stock. But I had a ball. Video: Hey, man, it’s the eve of Christmas Eve. Time to watch Alastair Sim as Ebenezer Scrooge! You’ll laugh, you’ll cry! The perfect movie! Merry Christmas!